Premium audio solutions previewed at Enterprise Connect are now available to increase productivity and enhance the "worker experience"
April 11, 2019 – Global audio leader Sennheiser announces two new products, adding crucial capabilities to tried-and-true, top-selling Sennheiser product families in both the headset and speakerphone categories. 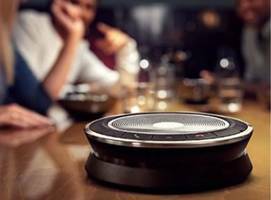 The company has released the new SP 30 Speakerphone, a wireless conferencing solution that brings Bluetooth® to its line of portable, plug-and-play audioconferencing solutions. In addition, the new premium wired, Century™ SC 660 ANC USB headset adds Active Noise Cancellation (ANC) and proximity-sensing capabilities. The ANC feature can be switched on and off via the in-line call control, and the headset’s innovative proximity sensor technology allows users to take a call, put it on hold, and resume the call by simply taking the headset on and off. It features thick leatherette ear pads with a high level of comfort and passive noise damping which ultimately enhances the audio music performance. Sennheiser’s finely engineered Voice Clarity and the ultra noise-cancelling microphone provide a natural listening experience and impeccable speech output. The new Century™ ANC costs $249.